Bright sunshine this near-noon Thursday melding with only a wisp of wind, producing what could be called a ‘heat wave‘ for here on California’s north coast. However, inland just a short space and an actual ‘heat wave’ with temperatures in the triple digits — we’re reportedly at 72-degress right now. 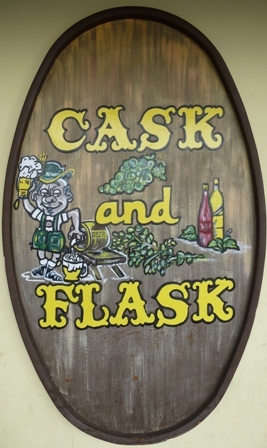 Although now retired nearly three years, today is the 10th anniversary of starting work at my very-last job at Cask and Flask Liquors in the Mckinleyville Shopping Center — I ended up the manager for nearly five of those years. A more-detailed account of the hiring can be found here. The hedge funds’ troubles started in April, worsened in May, and by mid-June had become a full-blown crisis. Even Bear’s injection of $1.6 billion couldn’t save them. By mid-July both were next to worthless. Less than three weeks later, the stock was way down, Spector was gone, and Bear was selling more than $2 billion in debt — both to shore up its balance sheet and to demonstrate that its assets were still valued. To oversimplify the Bear Stearns situation, the subprime mortgage-backed securities market behaved well outside of what the portfolio managers expected, which started a chain of events that imploded the fund. Unfortunately, the Bear Stearns portfolio managers failed to expect these sorts of price movements and, therefore, had insufficient credit insurance to protect against these losses. Because they had leveraged their positions substantially, the funds began to experience large losses. — online post Sep 6, 2007 at Investopedia.com.